I finished reading this back around April of this year. It is not exactly like the television version with the same name. Though it starts out like it does in the show, it goes a completely different way by the 2nd volume. However, this is an amazing graphic novel series! 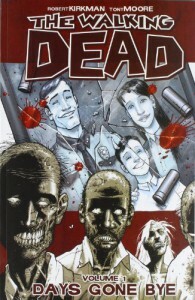 Kirkman did a fascinating job with the way he spent time focusing on the characters rather than the undead. It's not the type of read for just anyone, but it really is worth a read, once. I feel if you already have seen the show or haven't yet and wish to, then you should pick up a copy because it'll help fill in those gaps or answer questions that the show hasn't yet. It surely helped make sense as to HOW everything played out; where as in the show they kind of went a different route that from what I've read in articles and seen on the preview for the new season, they are going back to the comic series story line. So now is a good time to jump on the bandwagon for the graphic novel series.